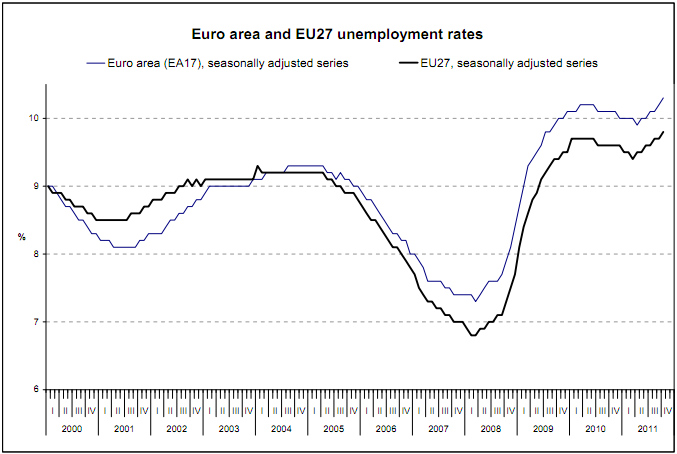 The euro area (EA17) seasonally-adjusted unemployment rate was 10.3% in October 2011, compared with 10.2% in September. It was 10.1% in October 2010. 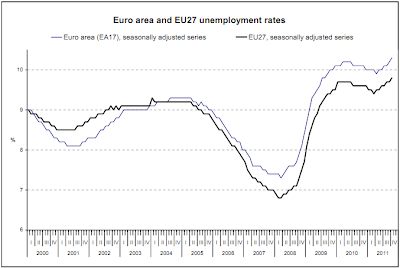 The EU27 unemployment rate was 9.8% in October 2011, compared with 9.7% in September. It was 9.6% in October 2010. Eurostat estimates that 23.554 million men and women in the EU27, of whom 16.294 million were in the euro area, were unemployed in October 2011. Compared with September 2011, the number of persons unemployed increased by 130 000 in the EU27 and by 126 000 in the euro area. Compared with October 2010, unemployment rose by 440 000 in the EU27 and by 367 000 in the euro area. Among the Member States, the lowest unemployment rates were recorded in Austria (4.1%), Luxembourg (4.7%) and the Netherlands (4.8%), and the highest in Spain (22.8%), Greece (18.3% in August 2011) and Latvia (16.2% in the second quarter of 2011). Also, the flash estimate for Euro area inflation in November is available. It is 3% - not exactly flirting with deflation.